Based on the multi-awarded, homonymous manga, written and illustrated by Yuki Suetsugu, “Chihayafuru” revolves around Karuta and the relationship of a girl with two boys. Karuda (coming from the word card) is a card game, where each card contains a waka (classical Japanese poetry) poem. It is played one on one, facilitated by a reciter (card reader) and a judge. Each player has a deck placed in front of him, consisting of 25 cards that he places face-up, in three layers in his or her territory. As the reciter reads a poem from a reading card, the players have to touch first the corresponding to the poem playing card, which contains only the last phrases of the poem. The game is a combination of memory (the players have to remember the poems) and agility (the players have to be quicker than their opponents are, when touching the card). The game is relatively popular in Japan (not as much as Go, for example) with the number of competitive players syrpassing 10.000, and there is a national championship tournament held every January by the All Japan Karuta Association, in Otsu, Shiga. There is also a national championship for high school students held every July, and recently, an international tournament, with players from the U.S., China, South Korea, New Zealand, and Thailand. Chihaya Ayase, a high school student, is obsessed with the game, playing since childhood with two of her schoolmates, Arata Wataya and Taichi Mashima. The three of them were separated though, and Ayase has been playing by herself for some time. In high school, however, she finds again Mashima and the two of them try to establish a Karuta club in their new school, since there hasn’t been one, until now. Eventually, they manage to find three other members, Kanade Oe, a traditional poetry enthusiast, Yusei Nishida, also a player since childhood, and Tsutomu Komano, a nerd obsessed with trains, who ends up in their club just because he wasn’t keen on signing in any other. The five of them train rigorously to compete in the school competition, while Arata is in Tokyo, caring for his grandfather, a Karuta Master, not sure what he wants to do with the game, despite the fact that he is the best player in his age. Furthermore, the three of them, Ayase, Arata and Mashima form an underlying love triangle, with Mashima actually playing to be close to Ayase, her having some feelings for Arata, and him being, once again, not sure of his own. In the second part, as the team training becomes even more rigorous, things become more complicated by the presence of the Karuta Queen, Shinobu Wakamiya, who seem s to have an interest on Arata, since the two of them are the best players in their age. Norihiro Koizumi directs a film that would be another school romantic comedy, if not for the main theme of Karuta, which gives the title an additional depth, making it stand apart from the many entries in the category. In that fashion, the love -triangle stands somewhat in the background, as the game is actually the main theme. The characters are very interesting in their variety and their analysis is quite thorough. Koizumi bases the majority of the film upon Suzu Hirose (she is rapidly ascending the stairs to stardom, also appearing in films like “Our Little Sister”) and she delivers in wonderful fashion, artfully exhibiting a plethora of teenage sentiments and notions including obsession, sadness, vulnerability, enthusiasm, cheerfulness, etc, not to mention she is also gorgeous. Shuhei Nomura as Mashima has the archetypical role of the “pretty boy who does not realize it” and Mackenryu as Arata, the one of the “beautiful, melancholic boy.” Both of them are quite good in their roles, although the latter’s role is smaller. Yuki Morinaga is great as “the nerd” Tsutomu, particularly in the scenes where his frustration surfaces. Mone Kamishiraishi is also very good as the almost always cheerful Kanada, and red-haired Yuma Yamoto, as Yusei, functions nicely as a comic relief character. Mayu Matsuoka makes a nice rival for them all as Shinobu and Jun Kunimura (who seems to be everywhere lately) is always a nice presence as the kid’s teacher in Karuta, who is also a priest. Technically, the film retains a very nice atmosphere, with great cinematography, editing, and music, that portray nicely the school environment, but actually show their prowess in the competition scenes, where, along with Koizumi’s direction, present scenes of beauty and agony. 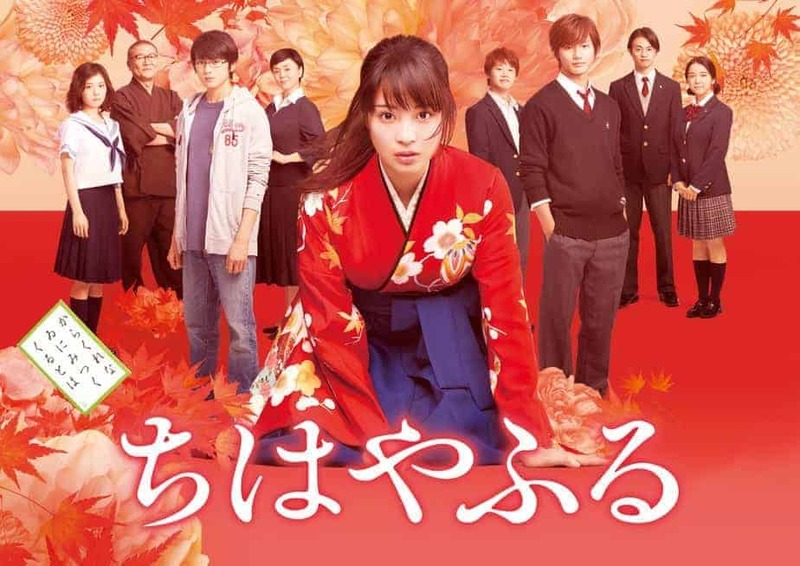 Chihayafuru is a very beautiful film that transcends the borders of the school rom-com through the concept of Karuta and a number of very interesting peripheral characters. PS 1 A sequel has already been greenlit. The film is part of the excellent Asian selection of Fantasia International Film Festival that will be on in Montreal until August 3.